In one of the most interesting run-ups to a Republican Presidential Nomination Election in recent history, multi-billionaire property magnate Donald Trump has emerged as an unexpected leader for many in the party. Trump's initial announcement that he was running for President was trivialised by most commentators, as a publicity stunt by a man seeking to simply push further his name brand into the public spotlight. His failed 2012 campaign had also done little to convince anyone that Trump had the capacity to sustain a strong campaign to gain Republican nomination. However, 'The Donald' has surprised his doubters so far and currently stands head and shoulders above his Republican competitors in the polls. According to Newsweek, he is almost two times more popular among Republicans than his closest competitor, Jeb Bush, with a stunning 32% approval rating. So, why is Trump doing so well in this election, when he failed miserably in the last? 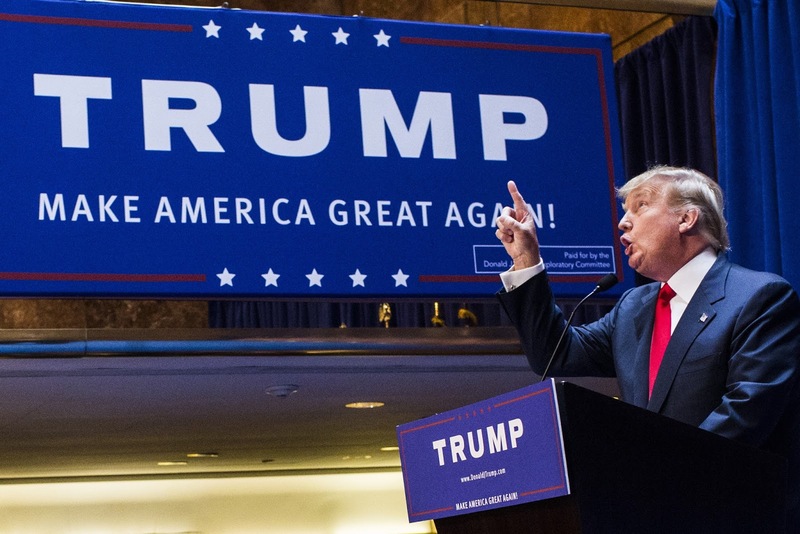 From his first step on the escalator down to his announcement speech, to his challenging the Pope in a recent interview with CNN, here's a look at 4 reasons why 'The Donald' is coming up trumps in 2015. 1) He doesn't give a damn about PC, or general manners whatsoever. To some, Donald Trump is a self-made business visionary to some, and to others a bombastic example of the evils of capitalism- but what is pretty much certain is that he is a bold, often divisive personality who is rarely afraid to say what is on his mind. Some truly hilarious moments have emerged out of Trump's campaign as a result of his apparent lack of limits in what he says and does. Whether it's giving out fellow Republican Lindsey Graham's personal number out during a speech, saying that he likes "people that weren't captured" when John McCain's time as a POW was being applauded by the public, or claiming that a female interviewer was on a period because she was asking him difficult questions, Trump's often wacky remarks have ensured him the public spotlight in recent months. But there is a more serious side to Trump's lack of restraint (and views in general). Certain statements of his, notably his claim that immigrants from Mexico are mostly rapists and criminals ("some, I assume, are good people" he brazenly claims), suggest a darker side to Trump that did turn off a large proportion of the population- but at the same time must have had the opposite effect on others. Multi-millionaire 2012 Republican Candidate Mitt Romney became noted for his attempts to hide his wealth in the run up to the election, trying to shake off the 'Corporate Republican' image that turned many voters off. Donald Trump, on the other hand, couldn't care less about showing that he is a 'man of the people'- indeed, he believes his position high up in the economic ladder puts him in a perfect place to be President, and he's not afraid to show off the fact. "I'm proud of my net worth. I've done an amazing job," announced Trump in his announcement speech, before revealing his supposed net worth of almost nine billion dollars. The man is clearly unafraid to show off his wealth, and this works on many voters. Not only does it boost his image as a successful businessman (despite his numerous bankruptcies in the 1980s), thus reinforcing his claims to become the "greatest jobs president God ever created", but it creates an aura of aspiration, the American Dream, around Trump. Some people see Trump as a man who has succeeded in life, by achieving The Dream and becoming extremely wealthy, and these people take this to be a sign that he will be a similarly successful president. Not only is his vast wealth helpful in this sense, but it proves a necessary boost in a political system in which money is king, for anyone who wishes to partake in it. For Trump, it seems his own money has come very handy indeed- during the second quarter of 2015, Trump's campaign raised $1.9m. Of this money, Trump had donated $1.8m. Yes, that's right. Just 1/19th of Trump's campaign donations came from people other than himself. More recently, Trump has announced that he would be willing to spend up to $1bn in his campaign to become President. Donald Trump really likes his name. Donald Trump is not just a person, but he is really a brand; as anyone who has visited his flagship Trump Tower knows, his name and image is a massive part of who he is (of course, as well as his money). 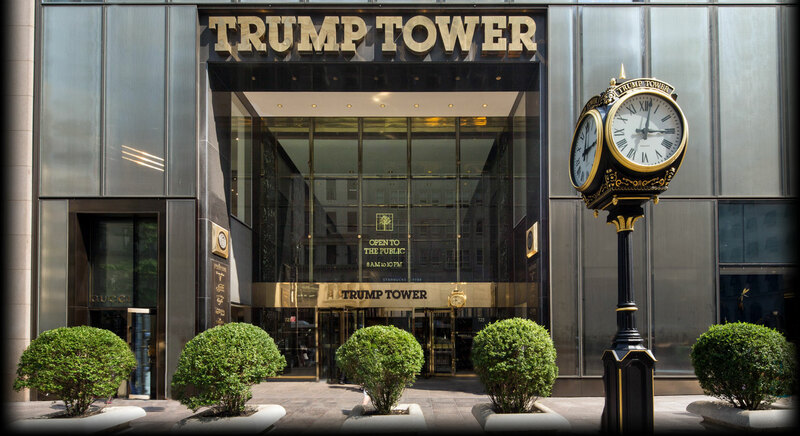 Trump T-Shirts, Trump Teddy Bears, Trump Mugs- you can find an abundance of Trump goods in his New York skyscraper. The man has also hosted the popular but also 'Celebrity Apprentice' on NBC, and was the owner of the 'Miss Universe' vanity competition. Compare this with Trump's competitors. Before entering politics, Jeb Bush had positions in banking and oil companies and Rand Paul was a doctor. 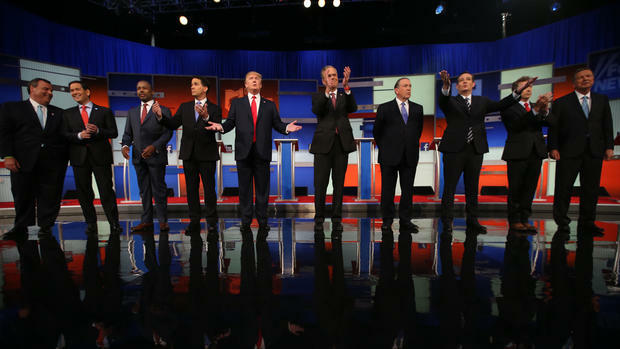 Marco Rubio has basically always been in politics. Trump's career is by far the most glamorous, something that by default is likely to win him some voters. People who liked him from The Apprentice, for example, are by far more likely to vote for him rather than his competitors. Trump has for a long time worked in the television industry, one that relies almost entirely on approval, popularity. Therefore, he is likely to know what 'sells' in the arguably similar political arena. His divisive comments may mean that the audience he attracts is not always going to be the same, but his audience may see a shift rather than a shrinking. 4) His policies are popular among Conservatives. In a way (other than just his hair), Donald Trump reminds me a little of Boris Johnson. Behind all the buffoonery and show, there is a functioning Conservative mind that is proposing policies that do actually appeal to those on the right as much as they infuriate the left. One of the things that really puts Trump on the map in the Republican Party is his stance on immigration, for example. This is clearly something he wants at the forefront of his campaign; as he stated in his announcement speech, he would "build a great, great wall" on the southern border between the USA and Mexico, to supposedly end the illegal immigration issue. Putting aside the logic of his proposal beside (he claims he will build it "inexpensively", yet he will "have the Mexicans pay for that wall"- so what's the point of making it cheaply? ), this solid anti-immigration approach has great appeal on the Conservative side. His economic policies are also textbook Republican- push for lower taxes and less regulation on businesses. And of course, a Republican candidate is incomplete until they make the typical announcement to put their mark on the Middle East- "Nobody will be tougher on ISIS than Donald Trump", according to the man himself. With such issues in which there is a danger of anti-immigration proponents being branded 'politically incorrect', Mike Adams from Natural News comes to an interesting conclusion- that Trump is so popular because he is "the surrogate mouthpiece for the things most Americans deeply believe (but are too afraid to say)". While I am not so sure whether most Americans agree with him, it seems apparent that there are many in the USA who are in such a position. But in being so honest and bold in his Conservative statements, Trump is running a dangerous risk of alienating even his supporters- his feud with his previous supporter Bill O Reilly, who now warns Trump will turn the Republican Party into one of 'racist brutalisers', suggests that Trump may be about to fall off his peak.